It is critical that garbage is stored inside a secure building in order to prevent easy access for bears. 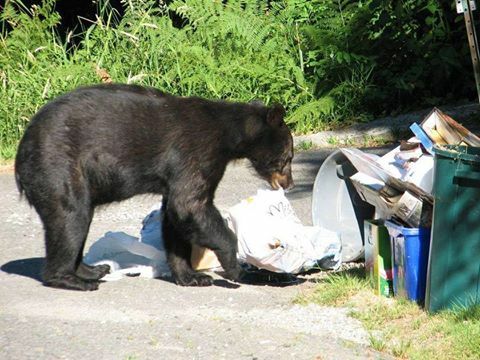 At this time of the year, bears should be going to sleep; however, if we continue to provide unnatural food for them they will continue to stay awake and get into garbage. Please spread the word and secure your garbage so we can keep our community safe and the bears wild. Habituation is an irreversible state in which bears associate garbage as food- once habituated, they do not unlearn this. It is critical that we catch these situations early and change our behaviour immediately before habituation occurs. 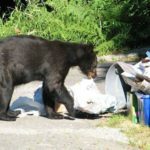 A habituated bear is more likely to act in unpredictable ways- bold despite human presence, protective over their new found food source and this can potentially be very dangerous for us, our children and our pets. We want the bears to continue to search for natural foods and sleep through the winter; however, this will not happen if they are habituated. Please be Bear Wise and secure your garbage! Want fewer bears put down? Manage your garbage, pick your fruit!